Preheat oven to 400 degrees. 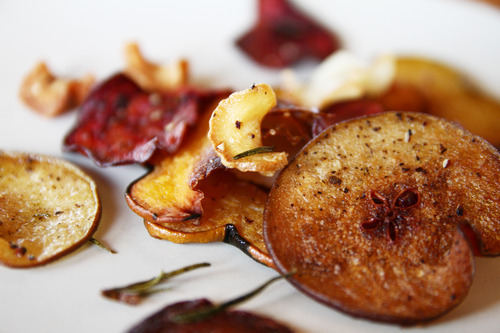 Slice all veggies thinly – the thinner the slices, the crispier the result. You can also use a mandolin to create nice, even slices. 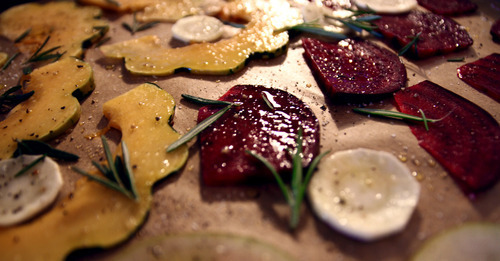 Line a baking sheet with parchment paper and lay out all slices. Drizzle with olive oil, season with sea salt, freshly ground pepper, and herbs. 3. Put in oven for 20 minutes until golden brown and crisp. Allow to cool for 10 minutes before serving.